First on my list is the SPF 40 Hawaiian Tropic Shimmer Effect Lotion Sunscreen with mica minerals that I purchased yesterday at CVS (I think it was about $8.00 regular price, and I'm pretty sure that I got a discount). 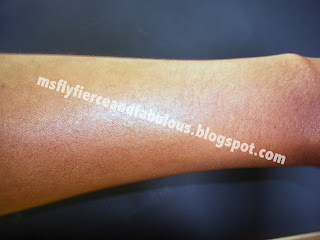 So essentially it does just what it promises on the packaging: protects, pampers and nourishes your skin. It gave my skin this golden shimmery glow, which actually makes me want to put on sunscreen LOL. I'm probably going to be rocking this year round because of this (technically you're supposed to wear sunscreen year round, and while out skiing to protect your skin btw Bella's), and I'm absolutely in love with it. Just like other sunscreens, be sure to put it on at least 15 minutes before sun exposure and reapply after swimming or towel drying. 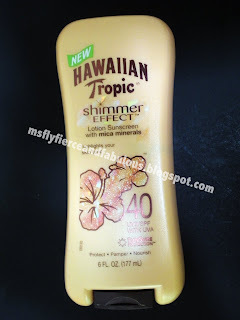 It also comes in SPF 20, and there's a Shimmer Effect Coconut Papaya After Sun Lotion available from the line as well.